The Australian Labradoodle was created in the 1980’s with the goal of producing assistance dogs that do not shed (for people with allergies). The Australian Labradoodle is not your normal “labradoodle” with a lad/poodle mix that you see in America. 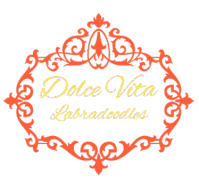 The Australian Labradoodle has been infused with up to 5 different breeds and have then been bred multi generational to achieve the best in temperament, conformation, and testings. We are committed to the integrity of the breed founded and developed by Rutland Manor and Tegan Park Breeding Facilities in Australia, and we only breed Australian Labradoodles whose lines are from the Breed Founders. First Generation (Lab bred to poodle). With the labradoodles first generation dogs, there are two different coat types. Flat coated, which feels wiry, and the fleece coat that feels soft. First Generation labradoodles are not a good fit for families that have allergies, and they most likely will shed. Second Generation (F1B, first generation bred to a Poodle). Same inconsistency of coat type, temperament, and will most likely shed but maybe not as much as a first generation. Third Generation (Second generation, F1B bred to second generation/or F1B or poodle). This would be the best option for non shedding, and the breeder should be able to give a slightly better view of coat type, temperament and shedding. ***If you are looking for a true to temperament, conformation, non shedding, and allergy friendly dog the Australian Labradoodle is your dog.